by Janet Ooi, IoT Industry and Solutions Lead, Keysight Technologies, Inc. Imagine recalling the medical device you designed and deployed because the battery could not last as expected. Imagine if an implanted device had to be surgically removed from a patient, whose very life depended on it. In fact, there was a recent case in which Implantable Cardioverter Defibrillators (ICD) and Cardiac Resynchronization Therapy Defibrillators (CRT-D) had to be recalled, due to premature battery depletion1. If a wireless medical device is designed well to perform the way it should despite the rigors of the real world, this would not happen. Wireless medical devices that fail to function as intended can cause harm to patients whose lives depend on them. Do you know the elements to consider in the design of a device, especially a life-critical medical device? IoT medical devices are currently driving innovations in sensors. What have traditionally been in hospitals or clinics can now be found in home environments, and in more portable forms. More focus is put into the design of medical devices that are non-intrusive, smaller and portable to support this paradigm shift. However, users are not expecting any less from their medical devices in terms of functionality and performance. 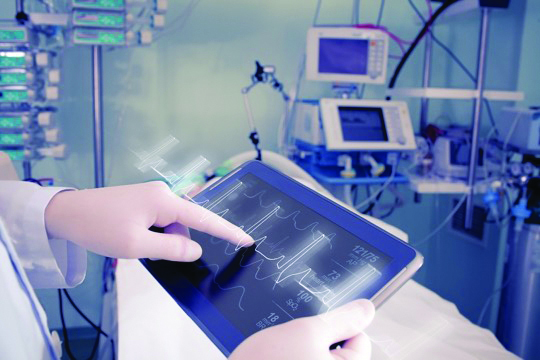 Electronics in a medical device rely on sensor signals as a basis for its control activities and accurate response. It is crucial to verify, tune and test sensor behavior during the product design stage. An arbitrary waveform generator (AWG) can be used to simulate highly accurate and clean physiological signals and variations of ideal signals, which includes infrequent pulses and impairments to simulate and characterize the response of advanced medical devices. Technology advancements in portable, wireless medical devices has put greater emphasis on the need to prolong the life of the batteries that power them. Batteries must be small, lightweight and able to accommodate demand for data handling, analysis and other inter-app functions in today’s connected world. Accurate characterization of the current profile in batteries then becomes critical at the design stage of the device to satiate the need for lower power consumption. An oscilloscope, DC power analyzer with source measure unit (SMU) or a device current waveform analyzer can be used to effectively test and validate the design of the power delivery network, depending on the dynamic current range and bandwidth of the wireless medical device. The rise in adoption of connected devices poses serious concerns for patients, as wireless medical devices are forced to compete for connectivity against a myriad of other devices operating at the same frequency. A cellphone’s operation could cause an infusion pump to stop working, or a pacemaker could be susceptible to hacks by unauthorized sources. Such incidents create potential risks to a patient’s safety and disrupts effective healthcare delivery. Radio frequency (RF) coexistence testing then becomes crucial to determine the ability of a medical device to maintain its functional wireless performance in the presence of other wireless signals on both the intended and nearby frequencies. Each test method has strengths and weaknesses and varies with respect to test repeatability, practical performance and test time. For all test methods, RF signals can be monitored and documented using a spectrum analyzer, especially one with real-time spectrum analysis. Hospitals and healthcare facilities house one of the most challenging RF environments. There are literally tens of thousands of highly mobile devices in any given healthcare facility. Network infrastructure in a healthcare facility is not straightforward; signals from WLAN-enabled devices may need to penetrate RF-reflective points to reach their access points and there are areas that are shielded for RF applications, which impede wireless signals. Medical device manufacturers can no longer trust that network design and configuration will be optimal for their products’ performance. To ensure absolute fidelity of patient data, alarms and life-critical events, providers must ensure real-time medical transactions reliably pass through the network. Wireless devices — medical or not —compete to connect to the wireless LAN (WLAN), creating a definitive need for an early verification strategy from design to product release and deployment. A comprehensive test including independent Wi-Fi benchmarking; real-world ecosystems; functional, soak, and stability test is needed to ensure the medical device and network do not impact each other. Enterprises, carriers, chipset manufacturers, and medical device makers are responsible for testing to ensure world-class and seamless deployment. Innovations and technological advancements are revolutionizing healthcare. With federal agencies governing and protecting public health through comprehensive regulations, and with greater demands from users, medical device manufacturers and healthcare facilities can no longer leave anything to chance. Fortunately, test solutions, infrastructures and best practices are keeping pace, helping to ensure product performance and mitigating risks. The cost of assessing new products prior to deployment pales in comparison to that of not testing. Janet Ooi is a lead in Keysight IoT Industry and Solutions Marketing. She graduated from Multimedia University in 2003 with B.Eng. (Hons) Electronics majoring in Telecommunications. She worked in Intel as a Process and Equipment Engineer for 5 years before joining Agilent Technologies as the Product Marketing Engineer in 2008. Since then, Janet has also taken on product management, business development, and market analyst roles. previous Which Wireless Technologies will Power the SMART Grid?